As an established, internationally active manufacturer of medical devices, MAQUET has to comply with FDA regulations with very high quality standards. This is particularly true in the area of product documentation, where MAQUET places high demands on the quality and security of documents in circulation and archived. 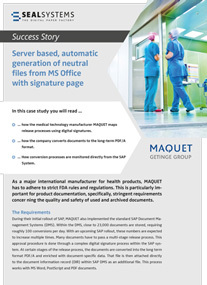 As part of a new SAP implementation and a first SAP roll-out, MAQUET has also introduced SAP DMS, which is used to manage 23,000 documents. The company performs about 100 conversions per day. In a few years, this volume will increase many times over with the coming roll-outs. Many documents are subject to a multi-level approval process. This is mapped within the SAP System using a digital signature process. At certain points in the release process, the processed documents are to be transferred to the long-term PDF/A format, enriched with document-specific additional information and stored as an additional file in the SAP DMS document info record (DIR). In this process MS Word, PostScript and PDF documents must be processed. … how the medical technology manufacturer MAQUET maps release processes using digital signatures. … how the company converts documents to the long-term PDF/A format. … how conversion processes are monitored directly from the SAP System. Matthias Müller is the Head of New Business at SEAL Systems. 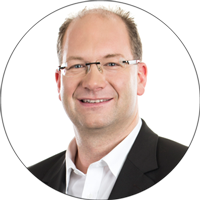 His main focus is to work out complex output management and conversion solutions and provide offerings for new customers. In addition he is responsible for our international activities. In his leisure times Matthias likes to be with his family or he has a ride with one of his bicycles.